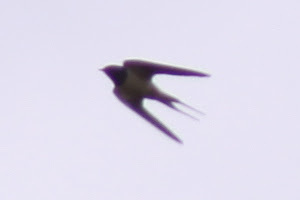 Birding Corvo 2009: The lost Swallows! Like we decided yesterday me and Simon (the man!) did Ribeira da Ponte during the morning hours. As usual we found nothing, but we just have to keep on looking! It's out there somewhere. A few showers fell as we did the valley and that's pretty much how the weather was during the day. Either sunny and hot or windy and rainy. Waterproofs on, waterproofs off, waterproofs on, waterproofs off... Simon showed me some new spots for me. Good looking places! In the "Garden of Eden" I'm gonna find a Blackburnian Warbler after he's gone back home I think (since he talks about that species about ten times every day). We split up and did some different fields and small valleys on our way back down towards the village. A heavy showe came and I decided to get a lift down to the village, but after only 500m I met Simon and decided to get off. That nearly cost me a foot since the driver started driving again as I was getting off the car having my foot on one of the wheels! Shortly after that I found an odd Starling flying over the Rubbish Dump. Starlings out here have a bad habit of looking like Swallows all the time, especially when they descend quickly from higher to lower altitudes. Anyway, this Starling soon turned out to be a Swallow as I saw the pale underparts of it! This was just what we both needed, some real action! After watching it for a while it cloned itself and there was two of them. 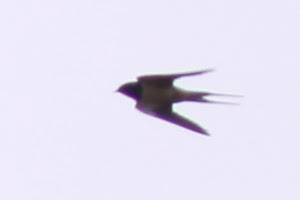 Both turned out to be Barn Swallows, adult ones. But which subspecies!? To be honest I didn't know what to look for at all on an adult bird apart from the colouration of the underparts. 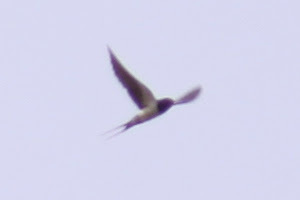 Got some lousy pictures of one of them before they disappeared behind a ridge, comments are very, very welcome! We went back to the guesthouse and recharged ourselves with orange juice, coffee, cookies and fruit before going out birding again. We also had a look in the American and European books we brought and judging from the plates in those it seems as and adult American apart from the rufous underparts should have a bigger throat patch and a thinner breastband between the throatpatch and the white body than the European. Am I right? Unfortunately the pictures are too poor for this to be visible. Judging from the underparts it looks like a European one I think (both birds looked very similar, being adults with pale underparts), or can an adult American be this pale underneath? Comments are VERY welcome! After the break Simon took a walk in the village (which gave a Whimbrel) and got a haircut while I walked up the road again to the Swallow hotspot arond the farmers' little houses along the road. As I got up there hell broke loose. The rain was massive! And of course no cars were passing by so I just had to walk back in the rain. After a while I got a lift back but by then I was already soaked and cold. In the evening we head an absolutely delicious chicken dinner at the airport restaurant. Normally the food is something fried (meat or fish) served with rice and french fries and then spiced up with some extra salt and ketchup. You do get a bit tired of that rather quick. Tonight we hit the jackpot though, especially since it was the dish of the day, meaning that we had to wait about one minute to get our food. Excellent! Good luck out there Olof! Great excitement to follow your quest! The european normally has a thick, black breastband between the red throat patch and white breast. While on the American the breastband is very thin and often absent towards the middle of the breast.